I’m back at Singlegate Primary School in Colliers Wood this term – this time the project is to enhance the library on a theme of birds. 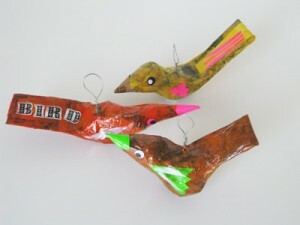 Step one: making these papier mache birds to hang in a flock – they have a button on the base to hold the wire in place…we’ll also be making bird books, a nest-like wall hanging and cushions. The children had some nice ideas to make clouds, rain and eggs too. This entry was posted in Workshops on April 26, 2009 by Jane Porter. I look forward to watching this project evolve. Looks great and always inspirational. these birds are so cute. i really enjoy following your artistic projects on this blog!